"Who’s the best team when it comes to soccer penalties?" Depending on where you reside, soccer might be a rather popular game. Any which way, if you landed on this page you probably know in some situations penalties will be the only way to decide who’s the winner of the game or the competition. 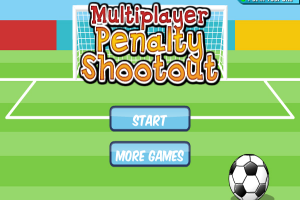 Now, here we present the freeware game called Multiplayer Penalty Shootout. Multiplayer Penalty Shootout is a simple game where you first will select the team you represent. As in the real soccer, penalties will be taken each one at a time. You’ll decide where your soccer player will shoot and when it is your team’s turn to try to keep your opponent from scoring, you’re in charge of defining where your goalkeeper will defend. Five penalty shots for each team will be taken and the team with the best score is the winner. Should the score be equal at that time you’ll have to keep going until it has been decided who is the best penalty shooter.